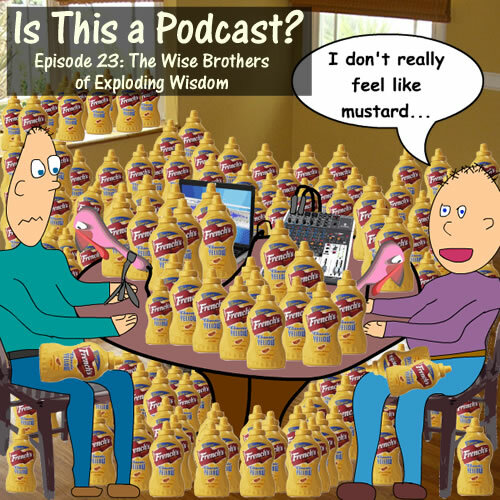 Hilarious banter ensues as two brothers discuss everything from the pros and cons of meat clothes to a heated argument over animal fluffiness levels, and everything in between those two things, that we just mentioned right here. Pizza Hut Commercial - Is It Wrong to Stuff Your Crust? We're bursting with videos! This one popped onto YouTube yesterday. I believe it's our best work yet. At least, in the YouTube world. I'll be honest, I'm not sure our first couple podcasts can ever be topped. We'll keep trying. Watch this video now and you be the judge! Another amazing gripping YouTube video is up, actually it went up five days ago. You should watch it, which you can do right here, right now, just by clicking play in the video window below! How convenient is that? Due to popular demand and outcry we are moving our podcast to YouTube. You'll get the same banter and wit you've come to love but in shorter bursts and in a visual medium. We hope you enjoy, and are sure you will. This episode we give you good advice about how to protect you and your loved ones from skull crushing hail! We also give you never before broadcast rapture instructions! Just wanted to update all the fans out there. We're working on Episode 25 and the plan is to release it as a video! I'm still working out the details, but I'm pretty sure we will still release an audio version as the traditional podcast and then also a YouTube video of the podcast. Due to the nature of YouTube these podcasts will be much shorter. So, either yay or boo depending on which length camp you are in. I'm guessing mostly yays. Toast. Do you eat it? Do you sell it on ebay? Are you haunted by it? How do YOU make french toast? ON YOUR STOVE IN A PAN!?? 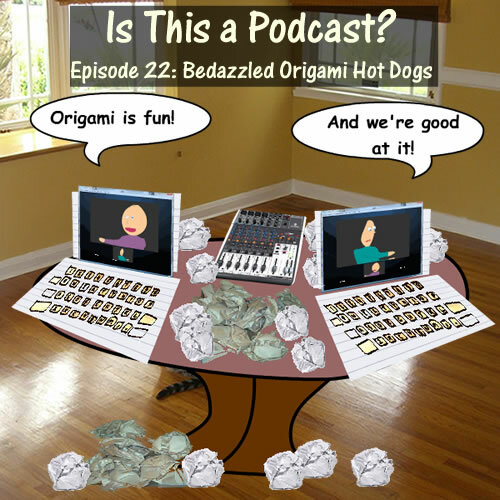 We're back and bedazzling vicious creatures in a whirlwind of black belt origami mastery. After a week away, we are rested and raring to go. Our comedy guns are blazing! No rust to be found here! No sir! Only gold. Once you listen, you'll see that this podcast was worth the wait. How does one follow one’s twentieth anniversary edition podcast episode? 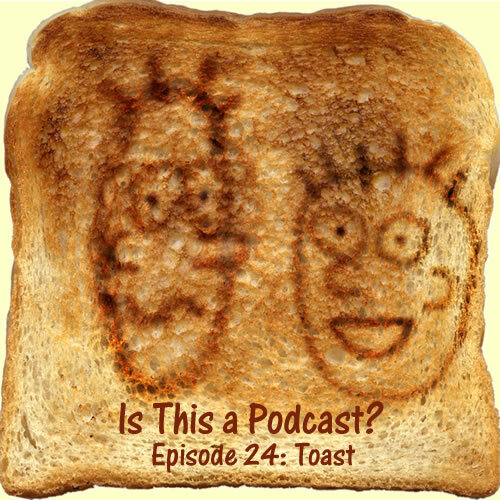 By posting Episode 21 and blowing the doors off of the podcasting community with such a fierce and wonderful episode, people won’t even remember the first twenty! THAT’S HOW! @# This week we revolutionize meat. MEAT! You wouldn't think that to be possible, but as you’ve come to learn, nothing is not possible with us no matter what you think about possibilities and whether they are or aren’t, you know, possible. We delve back into the popular cereal topic to come up with an idea so original, yet so brilliant in its simplicity, people will be astounded that it hasn’t already happened. Also, Starbucks gets its comeuppance…. I could go on, but I know I don’t need to. Just listen. And love. And send us cusp money.